Only a limited number of people regularly access the Acrolinx Dashboard to monitor updates to terminology, but everybody uses an email program all the time. 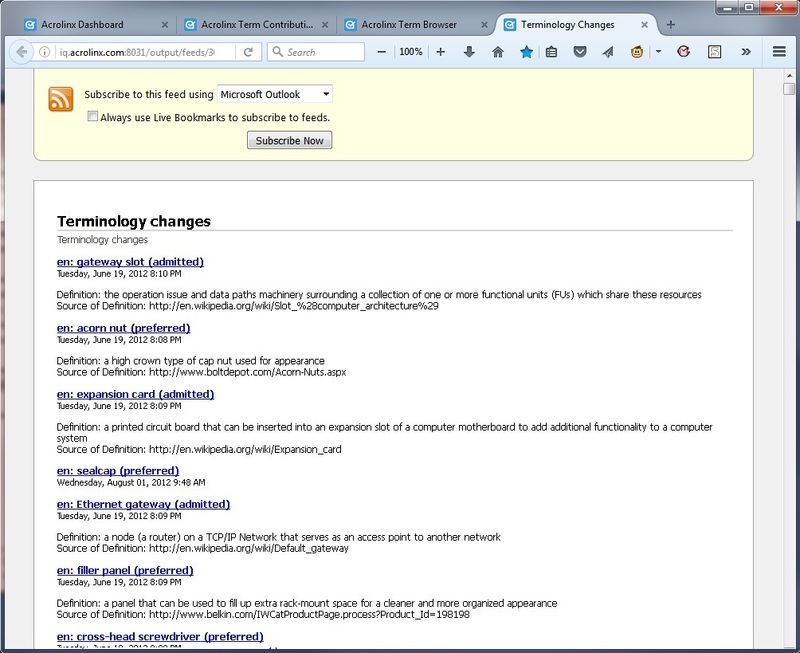 This article describes how to use RSS to publish terminology changes to applications like Microsoft Outlook. 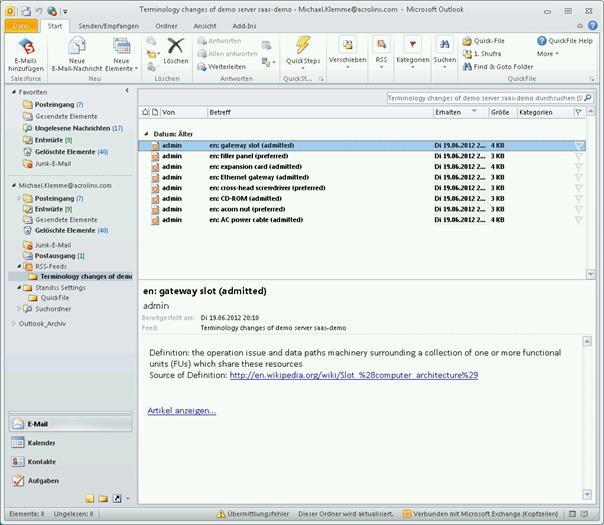 Then, anybody can add the RSS Feed to Microsoft Outlook and stay informed about changes. 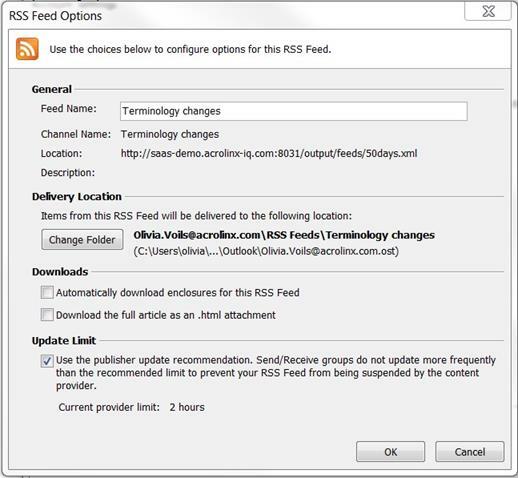 The RSS feed can also be syndicated to other programs such as a company’s web portal. Acrolinx terminology information can be exported to different XML formats. RSS is a standardized XML file format. It allows feeds to be published to other programs or websites. 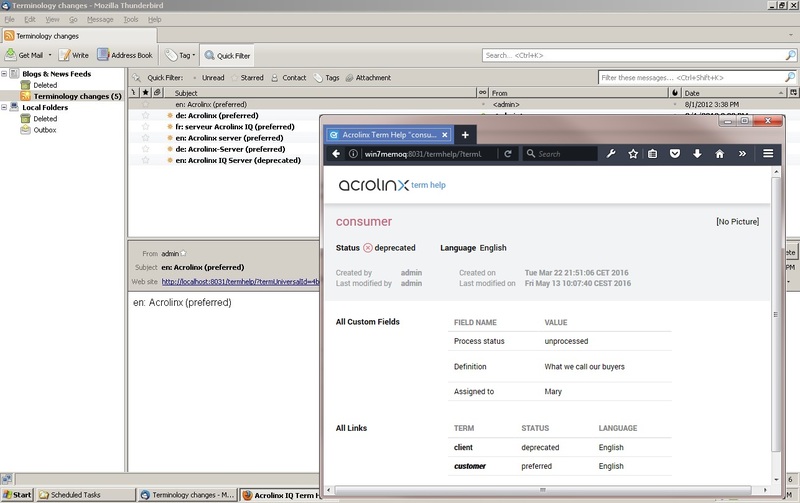 An RSS file can be created using the standalone Acrolinx term transfer tool. Because the tool is script-based, you can automate a regular export using the Windows Task Scheduler or a UNIX cron job. 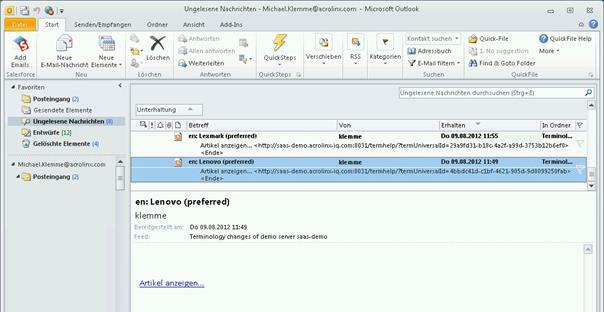 Microsoft Outlook can then subscribe to the RSS stream. The RSS stream can also be evaluated by other systems, such as a company portal. If you look in that directory, you should see a style sheet with a name like "Sample-RSS-export.xsl." If there's no style sheet with the word "RSS" in the name, you probably don't have the right style sheet. No problem, you can also download a copy of the style sheet here . Save it to the previously mentioned directory. 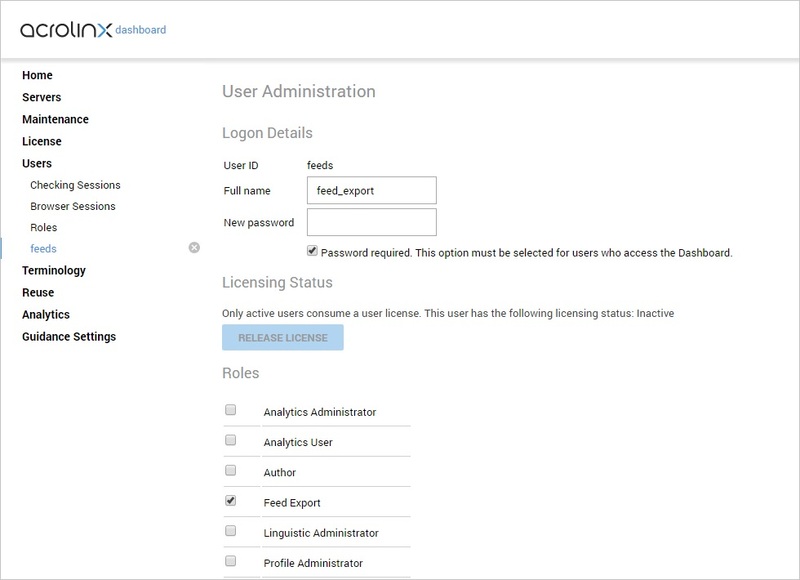 Create a new role with the appropriate user privileges to use the term transfer tool. 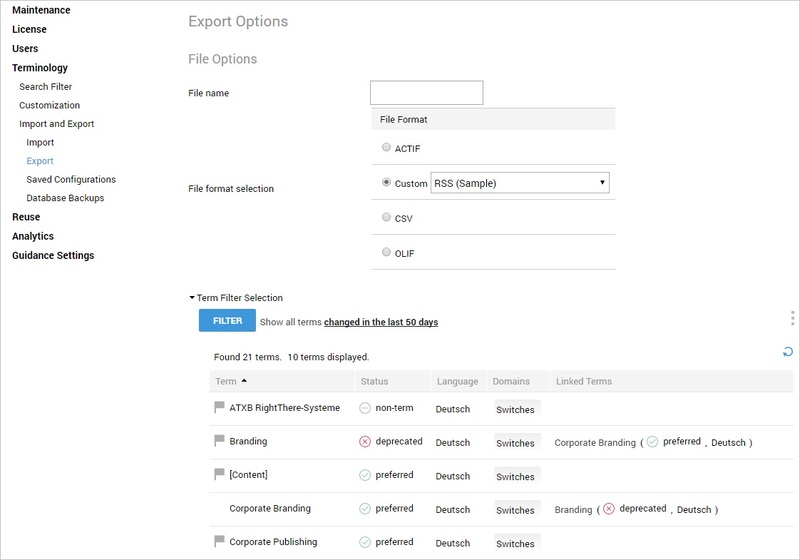 Add a designated user for the automated export and assign the required role. You can also re-purpose an existing user ID, but the password will be exposed in a plain text script file. 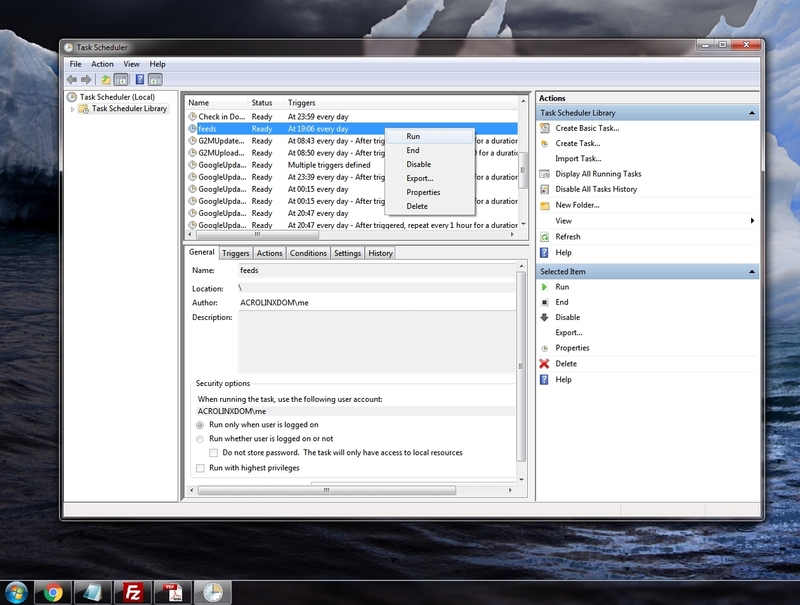 Use the term export wizard to create a saved configuration for the RSS export. 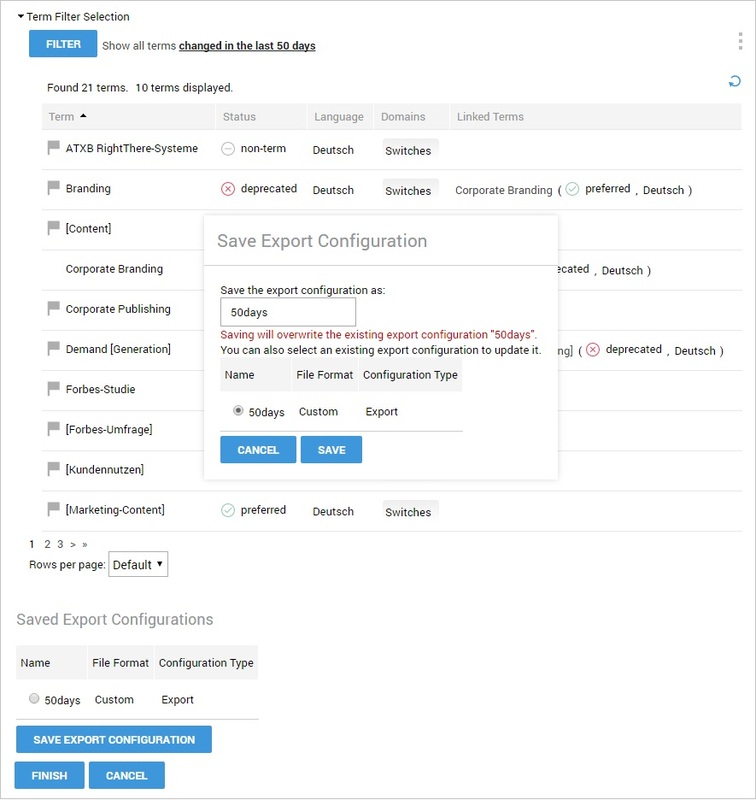 Use the filter to define a range of terms to export. Acrolinx can filter terms that were changed in a time period relative to today’s date. Select “in the last … days” and enter a number, but do not enter a number that is too high. Click Save Export Configuration to save your filter criteria with a meaningful file name. The automated process can be run on any machine, but it is probably easiest to use the Acrolinx server. If you have not already installed it, install the Java JRE . Unpack the Term Transfer Tool to a location on your computer. Create a server directory for saving the feed files. The directory needs to be available on a Web server – such as the Acrolinx built-in Web Server. We suggest creating a directory feeds under output . Create a directory to hold the feed batch files. In this directory, create a Batch File that calls the export. 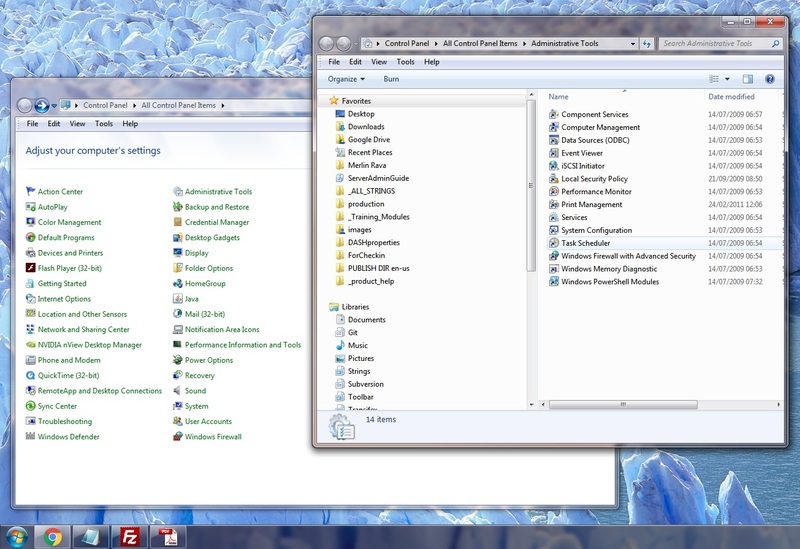 The Windows Task Scheduler can be used to execute a program at a pre-defined time or after specified time intervals. 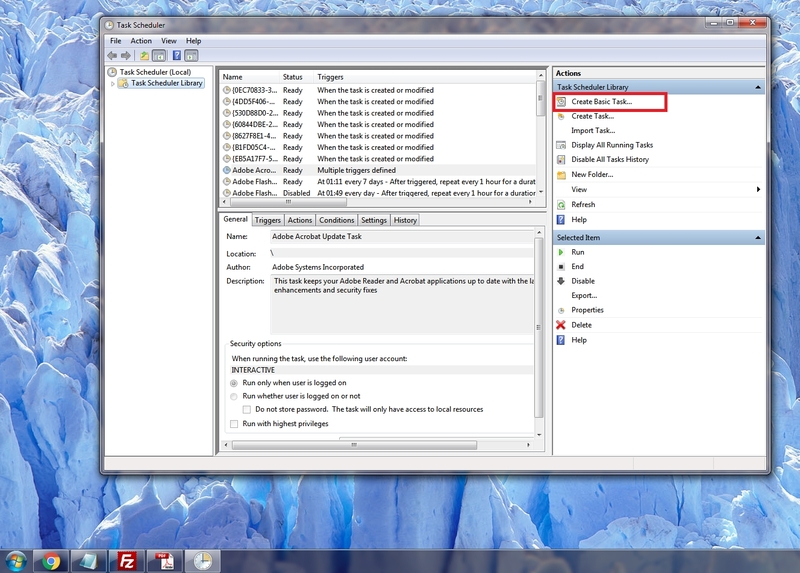 The following screenshots show how to Schedule Tasks in Windows 7. The new task now appears in the list. You can also start a task manually. Server URL: You need to configure the server name in the style sheet, so the links to the term database work correctly. Uncomment it and replace the example with your server address. Update interval: Configure how often clients shall retrieve the feed, e.g. how often the feed is renewed. The number 120 indicates the number of minutes that pass before the client checks for updates to the feed. Update it to meet your requirements. Feed description: You can define what fields from the terminology database should be displayed in the description area. You can also display comments with the term. The sample RSS style sheet should already have comments included. The following block of code in the description section is responsible for displaying comments. Replace the placeholder values and add this block within the description section. For example, you might add a sample context for all your terms. If you open the dashboard and navigate to Terminology > Field Manager you might notice that the "context" field has the field name "context" and the display name "Sample context." You would replace the placeholders <FIELD_NAME> and <DISPLAY_NAME> to match the names in the Field Manager. 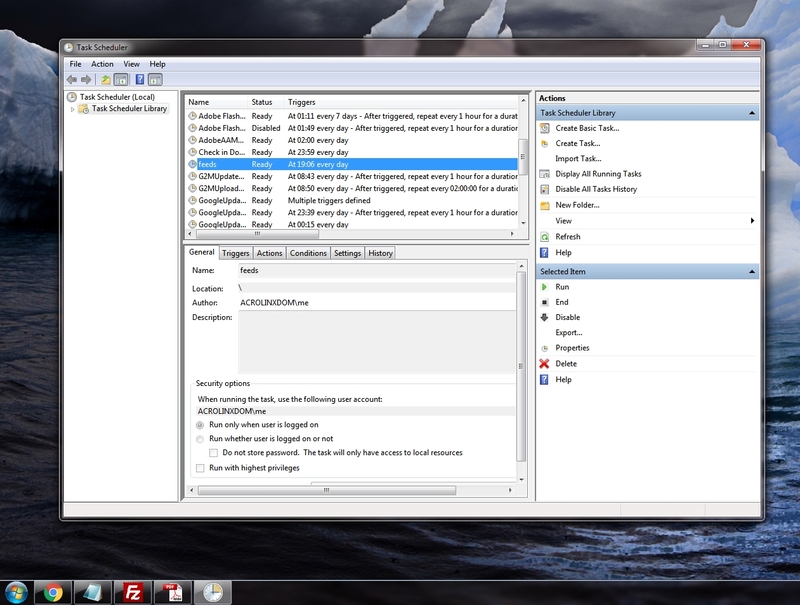 The RSS feed can be displayed by many different clients. This section shows some prototypical examples, and explains how to configure them. 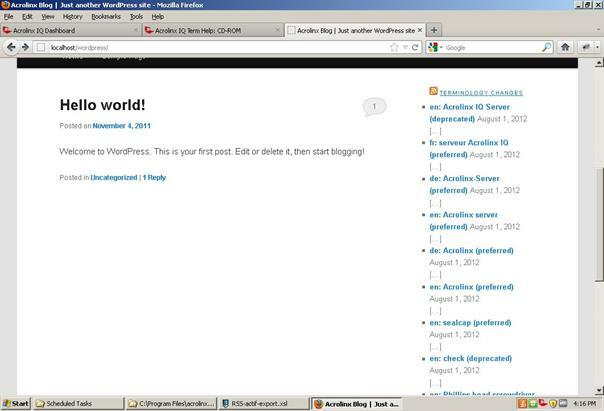 The RSS Feed can be loaded directly in web browsers such as Firefox. Thunderbird has a separate “Blogs & News Feeds” option that can be used to subscribe to feeds. Outlook Click the File tab. Open the Account Settings. On the RSS Feeds tab, click “New…”. Type the URL of your RSS feed. 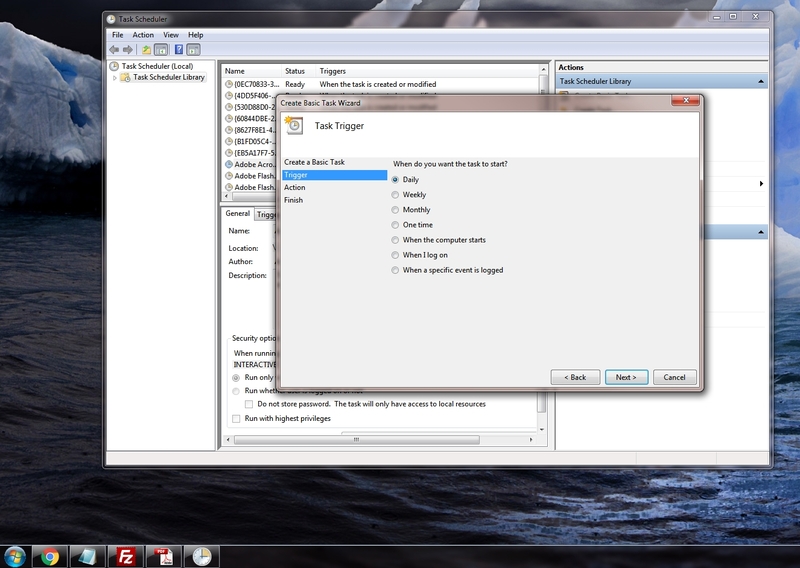 On the RSS Feed Options dialog box, click OK. The RSS postings appear in the RSS Feeds directory. New postings also appear in “Unread Messages”. 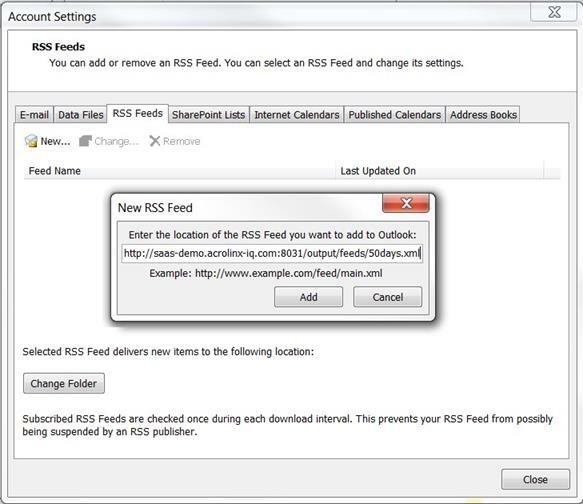 You can also publish the RSS feed to web-based applications, such as your Intranet Portal. Many web content management systems (WCMS) support RSS feeds as a standard feature.